Spring has almost sprung. This means backyard barbeques and lazy Sunday afternoons. A gorgeous backyard patio is just another reason to stay outside, giving you a great place to kick back and enjoy the sunset. A patio serves as a transition from the warm, comfy indoor environment to the awe-inspiring outdoors. The best patios know to mix the comforts of an indoor room with the beauty of nature. Once you grab your favorite novel and a drink, your patio becomes an escape from the world and also doubles as an extension of your home; giving you extra space to entertain guests when they come over. But building a patio can be a daunting project, and that’s why we’ve brought you some amazing back patio ideas to get your creative juices flowing! From vintage Americana designs to something more contemporary, we have all kinds of beautiful back patio design ideas. You don’t need a large space to build your dream patio. With the right setup, you can transform even the smallest outdoor areas into something that is truly awe-inspiring. With rustic, wooden flooring and lush green plants, this setup is ideal for those who would love to enjoy some time under the open skies. The tall, glass railings would provide protection from the elements while enjoying the views of the surrounding areas – and the wood flooring would make sure that the ground doesn’t get too hot during summers or too cold in the winters. Being exposed to the sun would cause the wood to fade out and add a sense of depth to it. However, if this is something you’d like to avoid then we recommend using a UV sealant to protect the entire setup. The hard teak sofa set with cream-colored cushions adds a touch of class to this beautiful patio. Overall, this is a great option for any mid-sized household on a limited budget and goes to show that you don’t need to spend an arm and a leg on a patio you can be proud of. The cobblestone flooring and stone ledge work together to create this chic design. The fireplace in the middle can serve as a place to huddle around for a nice evening with friends and family. The stone paving also means this patio is pretty long lasting, reducing maintenance costs. The rustic palette of the tiger maple wood echoes the woodland scenery outside. This simple, yet trademark Adirondack setup is perfect for families looking for a low-maintenance patio. The charcoal gray sandstone flooring adds a perfect transition from the cozy warmth of the indoors to the lush green outdoors. The sleek design of the home adds some elegant sensibilities to the vintage wicker chairs. This patio design is great for households living in an urban setup. The shrubs help maintain a sense of privacy without sacrificing the views of the city. The clean contemporary faux slits pair well with the wooden oakwood flooring creating a complete setup. The use of neutral colors in this setup is a key part of the entire patio. This picture-perfect porch is the epitome of simplistic, yet stylish country living. The porch overlooks a countryside lake and well-trimmed grass. The bright, vibrant colors from the flowers pair well with the neutral oak porch. This patio contains a sofa, a side table, and a cabinet expanding the usable outdoor space of the home and giving the family a comfortable place to relax and unwind. The striped sofa covering and brightly-colored pillows go well with the hand-poured concrete and the unfinished wood table. The cabinets to the side are also a great place to store some of your things, making this patio, not just a beautiful choice, but also a practical one. The low-key, neutral palette inspired by the pine trees surrounding this house, give this patio a charming rustic feel. This serves as a smooth transition from the warm indoors to the wild forests outside. Additionally, the sleek columns laid on top of an exposed brick foundation add to the overall decor of the patio. The design choice is pretty uncommon, but absolutely stunning when done right. It’s also a great way to blend the gothic era columnar structure to a more rustic-style, better suited for an outdoor lounge like this one. At the center, you have a relaxed seating area with a fire bowl allowing the family to linger outdoors even on cool evenings. 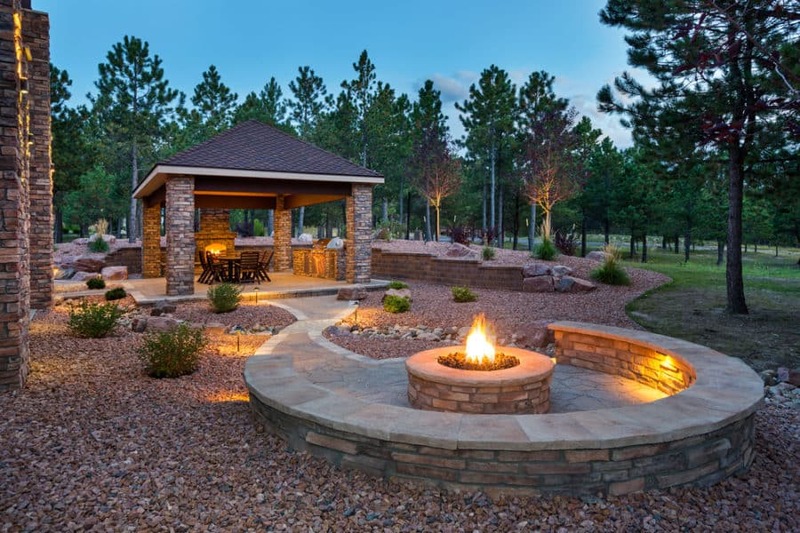 A crackling fire pit, like the one featured above, is a luxurious addition to any outdoor seating area. Giving your guests something warm and cozy to gather around is a great idea. This chic patio is built with a gas-powered fireplace and embodies the “no hurries, no worries” vibe. The top is covered with a plane-vaulted ceiling to protect those sitting on the patio from the weather conditions. The ceiling merges with the floor through the symmetrical exposed brick pillars on all sides. The novel fireplace is crafted from a combination of red and white brick that stretches all the way to the ceiling, completing the rustic (yet functional) styling of the patio. Guests can warm themselves on the teak wood sofa set, complete with a cream-white cushion and green pillows. The proximity of the sofa set to the fireplace makes it easy for the guests to keep themselves warm and comfortable. Simple forms, high functionality, and minimal ornamentation, this patio has an undeniably modern appeal. The patio design features a poured concrete ground topped with a wooden ceiling. The skylights only help embrace the feeling of minimalism and elegant design. This entire setup is finished with a sleek charcoal-grey wicker sofa set that serves as a low maintenance option for when you want to spend some time outside. The grey-hued concrete blends into the background and serves as a fantastic base to let the other elements in this design stand out. Its light color creates a soft, subtle palette for the patio while acting as an impactful design element in an otherwise minimalist space. This kind of patio design is perfect for families looking to expand their living space without adding a lot of clutter, and the minimalistic appearance would look great with the simple addition of a patio heater. This back patio is brightened up with hardwood, luxury chairs surrounding a dark glass table. A traditional gothic-style chandelier hangs above the entire setup, and the ottoman carpet on the floor neutralizes the sharp angles and sleek, metal feel from the entire design so that it doesn’t become too overbearing. The Georgian-style columns hold up the entire mansion with a facade of hand-cut stone columns while the seating area overlooks the pool. The seating area is far enough that those sitting by the patio won’t be disturbed by the kids in the pool, but is still close enough that parents can keep an eye on them. While the patio is covered, the yard opens up to the sky and makes for a welcoming location for houseplants which would benefit from the periodic rain and sunlight. Overall, this patio looks like something a billionaire sports team owner could afford, but believe it or not, it doesn’t cost very much. In fact, you can re-create this entire setup (without the pool, of course) for under $1,000. This beautiful outdoor kitchen is something that every home cook dreams about. The dark wood pergola adds a sense of class to this outdoor kitchen, while the tan teak cabinets and exposed bricks keep a sense of practicality. Pizza aficionados will especially appreciate the wood-fired oven which will get your neighbors begging to come over for dinner. This kitchen has a hint of a Southwest flair with its modern stainless steel appliances, offering a striking contrast to the neutral tone of the cabinets and walls. The Sequoia marble countertop features a warm shade of brown and provides a classic transition to what is an otherwise modern design. Additionally, chefs who like to grow their own ingredients would be pleased with the compact design that leaves a place for a small garden. We particularly enjoyed the fact that this outdoor kitchen has all the functionality of an indoor kitchen with the calming joy of being outdoors. Escape into the countryside with this beautiful Italian-style patio design. The gas fireplace makes it easy and convenient to keep the place warm on chilly nights, while the artistic brick overlay hints to traditional Mediterranean roots. The wild Tuscan shrubs provide an easy way to bring Italian romance and luxury into the comfort of your own home, letting you transport yourself into a 16th-century Italian farm stay when things were much simpler. This patio design is also brimming with subtle details that enhance its overall beauty. From the flowered tapestry on the pastel marble floors to the rounded off-white flower pots, screaming of Mediterranian influence. The lush, green shrubs are also easy on the eyes and make for a very relaxing environment while the high brick walls protect your privacy from nosy neighbors. The chairs can double either as a way to unwind with a book after a long day of work or spending the evening drinking wine surrounded by friends and family. Set up a chic scene for coffee and cocktails with this rattan-inspired patio set. This patio features wooden flooring complete with asher inlays, helping the space look sophisticated (yet comfortable) as a private place for a lounge in the sun. 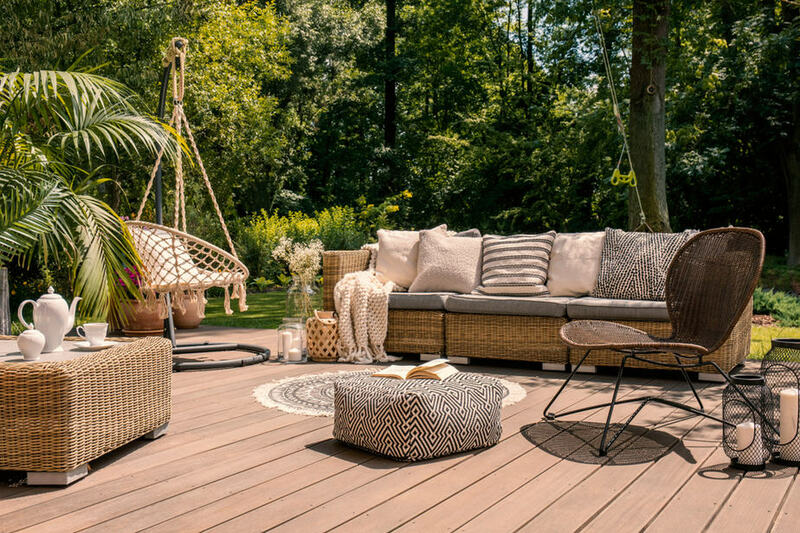 Rattan is a perfect patio decoration that adds the feel of summer into every room they fill. This makes it perfect as patio furniture (not to mention they’re extremely lightweight and durable). The hanging swing adds a sense of playfulness and also serves as a nice place to cuddle up under a blanket and read your favorite novel. This lanai-style patio offers a view that is usually reserved for once in a lifetime vacations. Imagine enjoying Mai Tai’s while taking in a gorgeous sunset – in the comfort of your own home! The communal-style seating arrangement and modest table design, with all its imperfections, work together to complete this look. The table at the center of this setup, however, steals our attention right away. Its raw, rustic feel bears a striking contrast to the smooth finish of the ceiling and floor. Overall, the materials and architectural details work together to pay homage to its Hawaiian roots. However, the great thing about this patio is that it does all of this without sacrificing even an ounce of sophistication. We love the mix of modern elements, such as the diffused light flowing through the ceilings and the sleek design for the sofa set. Another underrated aspect of this patio is its airiness. The open setup of the entire patio gives the space a relaxed vibe. When executed this way, the idea of a modern Hawaiian patio seems a lot more like a timeless motif and less like a trend. The durability of a patio depends primarily on the materials used. If you decide to go with a gravel-based patio, you can expect there to be a level of maintenance. However, these surfaces will last for a long time if you maintain them properly. The lowest maintenance choice would probably be a stone base. There are a variety of reliable, beautiful stones to choose from that would give you a fabulous-looking patio that will last you a long time. We hope these back patio ideas have inspired you to transform your home! If you’re planning on adding a swimming pool alongside your patio, check out our post on the Swimming Pool Ideas!